David Moore's first camera was a Coronet Box, received when he was 11 years old. 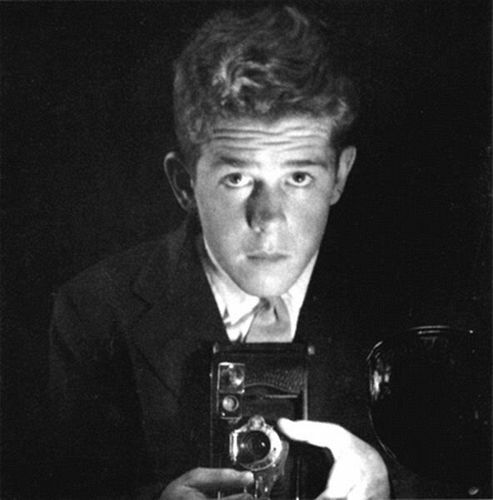 By the time of this self-portrait in a mirror, he had graduated to an old-fashioned Kodak folding pocket camera, which took 12 negatives on film. It could be focused manually and had a variable shutter speed as fast as 1/100th second. This photograph was included in the David Moore 100 Photographs series that toured the State Library of NSW (titled David Moore 100 photographs) in late 2005. The exhibition then travelled to Monash Gallery of Art, Melbourne, in 2006, changing its title to David Moore A Vision, 1927-2003; and then to Bendigo Art Gallery (2006), Shepparton Art Gallery (2006), Albury Regional Art Gallery (2007), Gold Coast City Art Gallery (2007), Wollongong City Gallery (2007), Mildura Arts Centre (2008), and finally to LaTrobe Regional Gallery (2008). A Limited Edition of the series was also produced.